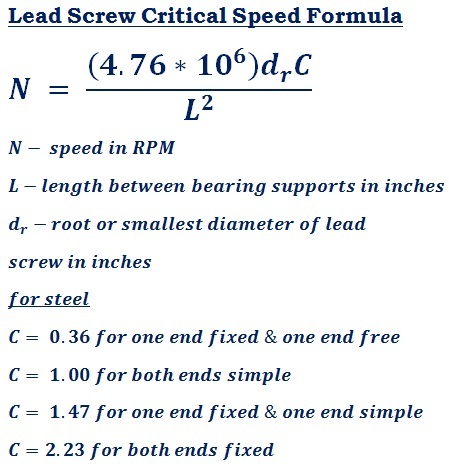 lead screw critical speed (N) calculator - step by step calculation, formula & solved example problem to find the angular velocity that excites the natural frequency of the power screw in mechanical power transmission. Length between bearing supports L in inches, root or smaller diameter dr & constant C are the key terms of this calculation. In field of mechanical engineering lead screws also know as power screws used to move large loads with minimum efforts, generate large forces & obtain precise axial movements in power transmission. The lead screw should be running under its critical speed, normally it can be rotate at the speed of less than or equals to 80% of its calculated critical speed.